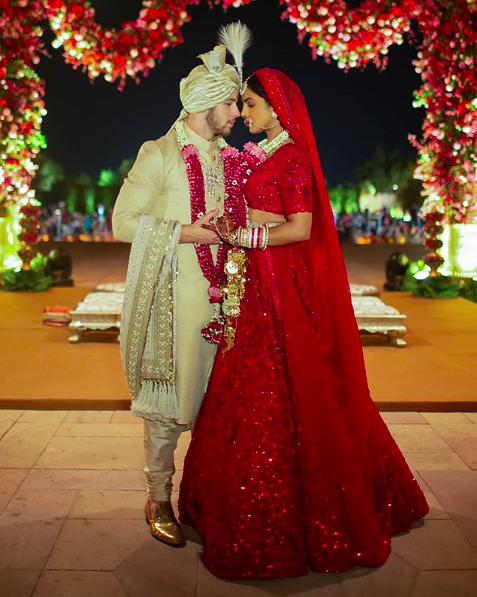 Over the weekend, Priyanka Chopra and Nick Jonas officially tied the knot at Umaid Bhawan Palace in Jodhpur, India. 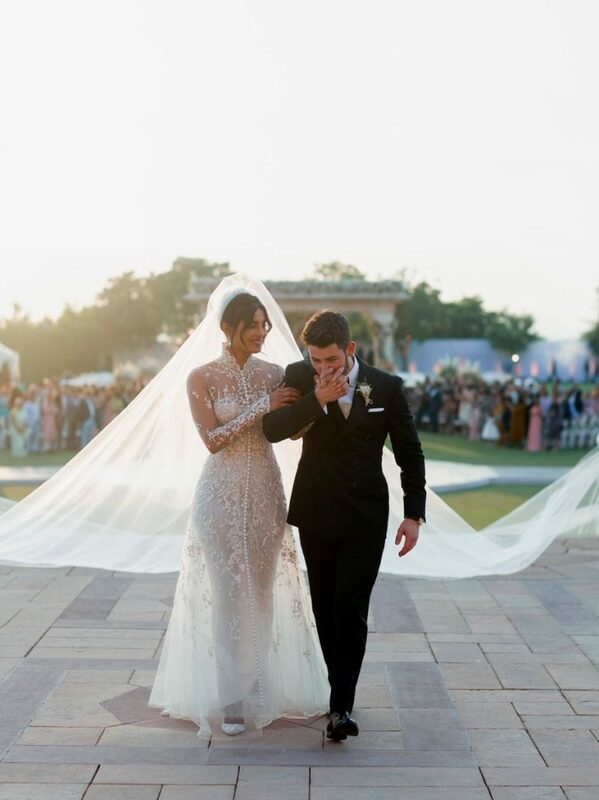 As expected, the newlyweds embraced both Indian and Western wedding traditions by hosting two wedding ceremonies – a Christian service officiated by Jonas’ father Paul Kevin Jonas, a pastor, and a traditional Hindu wedding – each held in different spots within the palace walls. For the Christian ceremony, which took place on Saturday, the actress wore a custom made Ralph Lauren wedding dress. The sheer, long sleeve gown featured a high collar, 135 satin-covered buttons, lace-effect tulle appliqués and hand-beaded and hand-embroidered floral and scroll motifs. 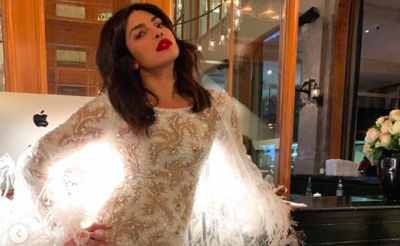 The dress, which reportedly took a total of 1,826 hours to complete, also included a piece of her mother-in-law’s own lace wedding dress, as well as eight words and phrases meaningful to the bride: family, hope, compassion, love, “Nicholas Jerry Jonas” (the groom), “1st December 2018” (their wedding date), “Madhu and Ashok” (the names of her mother and father), and “Om Namah Shivay” (a Hindi mantra invoking Lord Shiva). 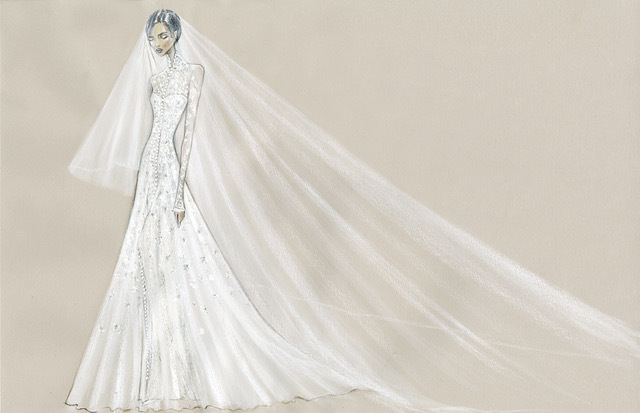 Underneath the gown, the bride wore a strapless column dress made of nearly 2.4 million mother-of-pearl sequins. Chopra completed the look with a dramatic veil, which fanned out 75 feet behind her and required five people to carry. 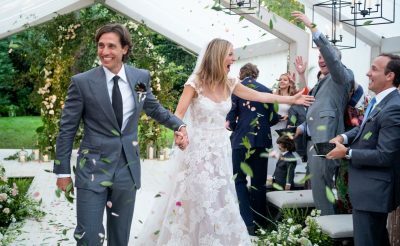 The groom also wore Ralph Lauren and opted for a six-button double-breasted black tuxedo. Stitched inside the lapel was a small piece of lace from Chopra’s gown and the Urdu words “my jaan”, which translates to “my life”. For the Hindu ceremony, Chopra wore a custom red lehenga by Sabyasachi, which took 3,720 hours to create, and a matching red veil. She accessorised the gown with Mughal-inspired jewellery. 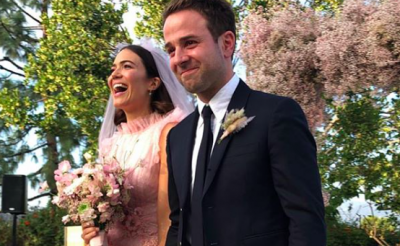 Mandy Moore marries Taylor Goldsmith in a pink wedding gown.